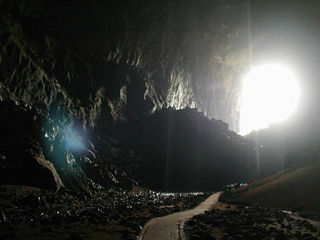 The largest show cave in this park, and it has the largest cave passage in the world. 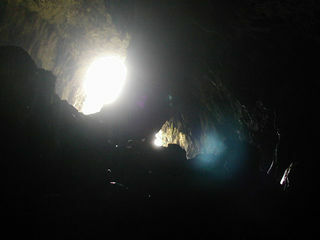 I couldn't think this is a cave felt like some building by mankind. 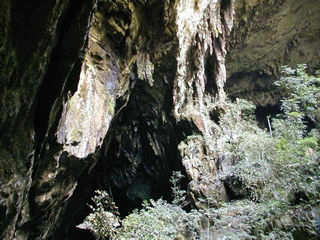 This picture is a view looking up from mouth of the cave. The tree on the right is really a very big one. Can you see? 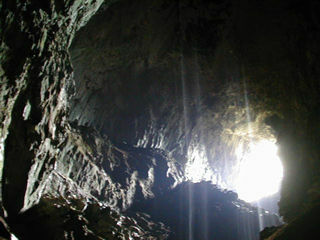 Deer Cave has a skylight on it's ceilling. Inside is partly lit by the sun light thrugh this window. Ceilling is really high. Some black spots are seen. They are bats, our guide said. Their droppings are everywhere in the cave. 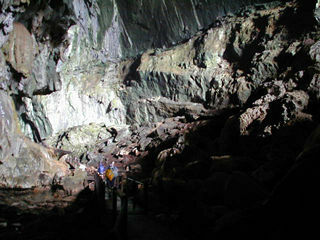 You can click the picture above for larger picture, and feel the biggness of this cave. "Abraham Lincoln's Profile" was seen here in the highest light. I don't know how to express this feeling, it's like a miracle. Really majestic!